The pain of PF is associated with walking/standing for long periods. This case study examines the impact of plantar fasciitis on the ability of Brian, a 40-year-old security officer, to undertake his duties. Sarah Bryden-Bradley and Anne Harriss show how structured frameworks were used to assess and appreciate the impact of his condition on his physical and mental health, and his ability to get back to work. First, the biopsychosocial model holistically considers the individual in the context of their health condition, social and psychological health as well as their work environment (Waddell & Burton, 2006). The Murugiah et al (2002) framework for assessing fitness to work was employed considering personal and legal aspects in conjunction with characteristics of the work and working environment as the basis for decision making and providing recommendations. A model for clinical history taking was adapted from Thornbory (2013); pain assessment used the PQRST (provocation, quality, region, symptoms/severity, triggers/treatment) approach (Elliott & Coventry, 2012). Yellow flags highlight negative personal thoughts, feelings and behaviours; blue underline workplace issues – for example, work demand; and black flags contextualise those outside the employee/employer’s sphere of control (Watson, 2010). Brian’s line manager requested a fitness-to-work assessment with advice for suitable adjustments to support and sustain a return to work. This followed two weeks of heel pain when undertaking patrolling duties and then one week of GP-certificated absence with a diagnosis of plantar fasciitis (PF). PF is a common lower limb disorder accounting for 15% of all foot ailments requiring treatment (Irving et al, 2006). 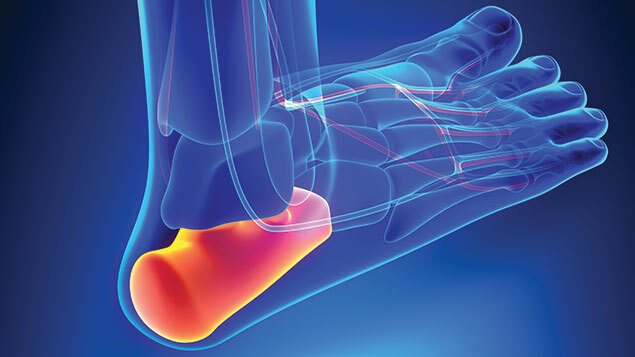 US research indicates 10% of the population will seek treatment for heel pain at some point, of which 83% will be part of the working population (Beeson, 2014). Plantar heel pain affects mobility and quality of life, including the ability to undertake social, sporting and work-related pursuits (Sullivan et al, 2015). Early OH support optimises a timely work return (Black, 2008), significant from organisational, individual and societal perspectives; and the financial and operational costs of absence are high (Chartered Institute of Personnel & Development, 2015). Individuals are less likely to return to work after only six weeks away (Waddell et al, 2008). The employer supports early return in the context of wider workplace health and wellbeing. The nurse-led OH service encourages management referrals, employees can access physiotherapy services and enhanced sick pay while on recuperative duties, and a culture where OH advice on adjustment to support early return to work is actively solicited by line managers. Brian’s fitness for role was evaluated using the Murugiah et al (2002) framework. The impact of his pain was considered in the context of personal aspects, work environment, work characteristics and the legal context of fitness for work. Personal aspects were assessed via clinical observation using a structured assessment of his functional abilities. A comprehensive history was taken using a model described by Thornbory (2013) and the biopsychosocial framework (Waddell & Burton, 2004) informed the assessment from a holistic perspective. Potential obstacles to return were identified using the psychosocial flags framework (Kendall et al, 2009). Brian described a three-week history of “stabbing pains … like hot pokers” in the sole of his right foot on waking. His stated inability to put the sole of his foot to the floor without pain was confirmed by observation. Functionally, he described difficulties walking any distance and an inability to run. Load bearing on his right foot was painful but he was able to drive. Experiencing burning pain in the median heel area and plantar fascia – the ligament joining the calcaneus (heel bone) to the toes – suggested PF (Thompson et al, 2014). The pain of PF is associated with walking/standing for long periods (Irving et al, 2006) and is usually more pronounced at the start of the day or after lengthy periods of standing or activity (Owens, 2010). Brian noted that his early-morning pain initially resolved with movement, returning after one to two hours and remaining present throughout the day, leaving him unable to walk any distance or stand without pain. Any assessment of functional capacity should be undertaken in light of the unique characteristics of the job role and working environment. It requires detailed knowledge of the essential and desirable role requirements (Murugiah et al, 2002). Brian’s work characteristics were evaluated during the assessment, with reference to the job description provided by management and the OHN’s knowledge of his work environment and typical duties. OH professionals must consider any company, statutory or regulatory guidance on fitness for work that may be in place when undertaking their assessment (Murugiah et al, 2002). Most pertinent to Brian’s role included the ability to stand for reasonable periods, run and walk reasonable distances. Brian worked an average of 40 hours a week over a rotating shift pattern. On any particular shift he spent two hours in the control room and the remaining time undertaking patrols lasting up to an hour, followed by a return to base. Brian could be called upon to give chase and run or stand observing for long periods at any point in his patrol. The causes of PF are not fully understood. However, the consensus view is that it is an overuse injury (National Institute for Health and Clinical Excellence, 2012) resulting in microscopic tears and inflammation to the plantar fascia (Irving et al, 2007). Increased cumulative strain at the point where the plantar fascia joins the heel bone causes microscopic tears. Inflammation results, and the tears are re-traumatised by repeated mechanical action, resulting in chronic inflammation and pain (Wearing et al, 2006). The evidence base for inflammation as the sole causative mechanism for pain, although restricted, suggests it may be a contributory factor (Johnson et al, 2014). More recent literature meta-analysis suggests micro tears, tissue degeneration and thickening as more likely causes of pain than inflammatory processes alone (Beeson, 2014; and Thompson et al, 2014). A number of contributory intrinsic and extrinsic factors have been linked to the development of plantar heel pain. Suggested predisposing characteristics include older age (Irving et al, 2006), gender (Sullivan et al, 2015), foot pronation, reduced flexibility and range of motion, and diminished muscle strength and stamina (Sullivan et al, 2015). External factors include increased body mass index (BMI), extended periods of weight bearing, poorly fitting shoes and wear, and previous foot injury (Irving et al, 2006). Waclawski et al, (2015) link PF with occupational walking and standing, however the available evidence in support of this is of low quality, requiring further research to fully understand the causal mechanisms. Recent evidence suggests that higher BMI, reduced flexibility between foot and shin, and muscle weakness are factors most likely to be associated with plantar heel pain. It is unclear whether they are causative or result from the condition itself (Sullivan et al, 2015). Brian’s BMI was within the normal range, no relevant previous medical history was disclosed, and prior to this episode, he had no reported sickness absence in the previous two years. Before his symptoms started, Brian attended the gym frequently and described his pre-symptom lower limb flexibility and strength as good. Brian reported visiting his GP shortly after the pain started and commented that the GP did not examine his foot and he was discharged with an advice leaflet. This may have led to a black flag event as Brian believed that his condition was not serious. Following rest and analgesia, he restarted work and social activities once his pain subsided. This was despite increasing discomfort and an involuntary turning in of his foot when walking, leading to an exacerbation of his pain. At this point he returned to his GP, was signed off work and referred to OH by his manager. Recommencing activity may have caused re-traumatisation, resulting in symptom return. Advice was given on the regular use of non-steroidal, anti-inflammatory analgesia, including ibuprofen. Brian had been in post for eight years and enjoyed his job working as part of a team of two. He had returned to full patrolling duties when his pain first subsided, not wishing to place any additional burden on his colleague. Brian also highlighted his domestic circumstances; he lived locally with his wife and young daughter. He usually undertook a significant amount of household duties (shopping, cleaning, and cooking), as well as childcare when not at work. He experienced pain and discomfort when undertaking these activities and indicated that his desire to continue with childcare and family activities conflicted with medical advice to rest his foot. A referral to OH shortly after Brian’s symptoms began could have highlighted the blue flags identified, minimising his subsequent work absence. Had he been more aware of the importance of rest, appropriate analgesia and footwear/insoles with referral for physiotherapy (Thompson et al, 2014) once symptoms commenced, Brian could have been advised that the avoidance of weight-bearing activities was key to prompt resolution of his condition. This may have assisted with his management of social and domestic responsibilities, allowing his foot to rest. An earlier assessment could have also provided management with the necessary information to manage workload and job roles and allay any concerns regarding Brian performing his duties. It is important to undertake a comprehensive, holistic assessment to understand the full range of personal, psychological, social and other non-work-related factors effecting a timely recovery and return to work. Brian was reassured that PF is generally self-limiting; the majority of cases resolve in a timely manner with conservative treatment (Jariwala et al, 2011). He was advised on factors believed to impact heel pain, including considering footwear with greater ankle and arch support, and orthotics (Thompson et al, 2014). He was referred for a course of physiotherapy to develop muscular strength and improve flexibility, and was encouraged to undertake regular stretching, for example, the “ice roll”, where the plantar surface is rolled over an ice-filled, plastic water bottle (Thompson et al, 2014). Prior to advising on fitness for work and planning for a return to the workplace, legal aspects must be considered, including the common law duty of employers to take reasonable care of their staff, employer liability, the provisions of health and safety at work, and equality legislation (Murugiah et al, 2002). Employers have a duty under health and safety legislation to ensure, as far as reasonably practicable, the physical and mental health and safety of their employees (Kloss, 2010). The assessment indicated Brian was not functionally unable to undertake many of his role requirements, including patrolling for up to an hour, incorporating running and standing for protracted periods. It became apparent that security duties in this working environment within a team of two, including solo patrols, put him at risk of harming his health, safety and wellbeing while the symptoms persisted. Brian and his manager were advised that he was not currently fit for full security patrolling duties. Brian was keen to return to work, believing that he was not truly “sick”. Negative perceptions on the part of an individual about getting back to work can have a significant impact on the likelihood of timely return (Giri et al, 2009). It was important to maintain Brian’s positive attitude while considering the impact on the workplace and his colleagues, thus a return-to-work plan with a period of recuperative adjusted duties was formulated. The evidence for short-term adaptations facilitating an early return is strong, as is the data confirming the cost effectiveness of such approaches (Waddell et al, 2008). Recommendations for adjustments supporting Brian’s prompt return to work were based on knowledge of workplace and wellbeing support, assessment of functional capabilities, and national guidelines (Black, 2008). A return on full hours was recommended in conjunction with an evaluation of his work boots, ensuring they provided suitable arch and ankle support. Adjusted duties to avoid tasks requiring prolonged weight bearing, such as patrolling, were recommended. An evidence-based stepped rehabilitation programme was proposed (Kendall et al, 2009) incorporating gradually reintroducing normal patrolling duties over a self-managed two-to-four-week period, subject to continued symptom improvement. The benefits of autonomy in organising and pacing patrol activities, allowing regular rest breaks, were outlined. Brian’s prognosis for a full recovery was stated as good with rehabilitation supported by physiotherapy referral. During a telephone review four weeks later, Brian reported wearing more supportive footwear with inserts and taking regular analgesia. His intrusive symptoms had subsided and he reported feeling more psychologically comfortable with resting in the domestic and social settings. He had discussed the rationale for this constructively with his wife, who had taken on more household duties. Brian had undergone four sessions of physiotherapy and was undertaking the prescribed exercises in between sessions. He said his manager had been very supportive of the proposed return-to-work plan, accommodating a week of control-room duties, followed by two weeks of graded return to full patrol duties that he managed well. New patrol boots with supportive inserts were also on order. Assessment of fitness to work requires the OH practitioner to have a range of knowledge and expertise incorporating a holistic appreciation of the client in the context of their life and work. An understanding of underlying pathology, disease aetiology and symptom presentation is critical and must be integrated with a detailed knowledge of the organisational purpose, roles, environment and culture. Finally, these insights must be synthesised with an in-depth awareness of the constantly evolving legal aspects of health and employment, supporting individualised recommendations promoting health and wellbeing within the business context. Sarah Bryden-Bradley MA, DipHE, RN, Chartered FCIPD is an occupational health nurse. Anne Harriss MSc, BEd, OHNC, RSCPHN, CMIOSH, NTFHEA, PFHEA, FRCN, Queens Nurse, is associate professor and course director of the occupational health nursing and workplace health management programmes at London South Bank University. Beeson P (2014). “Plantar fasciopathy: revisiting the risk factors”. Journal of Foot and Ankle Surgery, 20(3), pp.160-165. Black C (2008). “Working for a healthier tomorrow”. London: TSO. Chartered Institute of Personnel and Development (2015). “Annual survey report: absence management 2015”. London: Chartered Institute of Personnel and Development. Elliott M and Coventry A (2012). “Critical care: the eight vital signs of patient monitoring”. British Journal of Nursing, 21(10), pp.621-625. Giri P, Poole J, Nightingale P, and Robertson A (2009). “Perceptions of illness and their impact on sickness absence”. Occupational Medicine, 59, pp.550-555. Irving DB, Cook JL, and Menz HB (2006). “Factors associated with chronic plantar heel pain: a systematic review”. Journal of Science and Medicine in Sport, 9(11), pp.11-22. Irving DB, Cook JL, Young MA, and Menz HB (2007). “Obesity and pronated foot type may increase the risk of plantar heel pain: a matched case-control study”. BMC Musculoskeletal Disorders, 8(41). Available from: DOI: 10.1186/1471-2474-8-41. Jariwala A, Bruce D, and Jain A (2011). “A guide to the recognition and treatment of plantar fasciitis”. Primary Health Care, 21(7), pp.22-24. Johnson RE, Hass K, Lindlow K, and Shields R (2014). “Plantar fasciitis: what is the diagnosis and treatment?”. Orthopaedic Nursing, 33(4), pp.198-204. Kendall N, Burton K, Main C, and Watson P (2009). “Tackling musculoskeletal problems: a guide for clinic and workplace: identifying obstacles using the psychosocial flags framework”. London: TSO. Kloss DM (2010). “Occupational health law”. 5th edition. Chichester: Wiley-Blackwell. Murugiah S, Thornbury G, and Harriss A (2002). “Assessment of fitness to work”. Occupational Health, (54)4, pp.26-29. National Institute for Health and Clinical Excellence (2012). “Autologous blood injection for plantar fasciitis: interventional procedure guidance”. Manchester: National Institute for Health and Clinical Excellence. Owens BD (2010). “Diagnosis and treatment of plantar fasciitis in the military”. Orthopedics Today, May 2010. Available from: http://goo.gl/xlwKhR. Accessed 1 May 2016. Sullivan J, Burns J, Adams R, Evangelos P, and Crosbie J (2015). “Musculoskeletal and activity-related factors associated with plantar heel pain”. Foot & Ankle International, 36(1), pp.37-45. Thompson JV, Saini SS, Reb CW, and Daniel JN (2014). “Diagnosis and management of plantar fasciitis”. The Journal of the American Osteopathic Association, 114(12), pp.900-906. Thornbory G (2013). “Taking a history and making a functional assessment”. Occupational Health, 65(3), pp.27-29. Waclawski ER, Beach J, Milne A, Yacyshyn E, and Dryden DM (2015). “Systematic review: plantar fasciitis and prolonged weight bearing”. Occupational Medicine, 65, pp.97-106. Waddell G and Burton K (2004). “Concepts of rehabilitation for the management of common health problems”. London: TSO. Waddell G and Burton K (2006). “Is work good for your health and well-being?”. London: TSO. Waddell G, Burton K, and Kendall NAS (2008). “Vocational rehabilitation: what works, for whom, and when?”. London: TSO. Watson H (2010). “Flying the flag”. Occupational Health, 62(4),pp.30-32. Wearing SC, Smeathers JE, Urry SR, Hennig EM, and Hills AP (2006). “The pathomechanics of plantar fasciitis”. Sports Med, 36(7), pp.585-611.